An Integrated Ganga Conservation Mission – ‘Namami Gange’ has been launched in June, 2014, which approaches Ganga Rejuvenation based on lessons learnt and by consolidating the existing ongoing efforts and planning for integrated and comprehensive action plan for ‘Short-term’ (3 years), ‘Medium-term’ (5 years) and ‘Long-term’ (10 years and more). The projects and activities under this plan include pollution abatement measures for different sources of pollution and other policy initiatives. 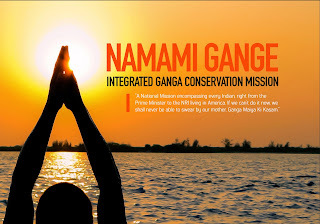 A report on “Ganga River Basin Management Plan – 2015” has been prepared and submitted by the consortium of 7 Indian Institutes of Technology (IITs), which has identified 7 thrust areas and 21 action points for the rejuvenation of Ganga and its tributaries. Work has already been taken up in identified towns located along the main stem of river Ganga and the State Project Management Groups (SPMGs) of the respective states have been requested to take up Sewage Treatment Plants (STPs) on a priority basis so that the sewage from these towns do not fall in to river Ganga. This information was given by Union Minister of State for Water Resources, River Development and Ganga Rejuvenation Prof. Sanwar Lal Jat in a written reply in Rajya Sabha today. Central Ground Water Board (CGWB) had informed that around 56% of the wells are showing decline in ground water level in various parts of the country as per the data of pre-monsoon 2013, compared with decadal mean of pre-monsoon (2003-2012). However, as per the latest ground water monitoring data of CGWB for pre-monsoon 2014, compared with decadal mean of pre-monsoon (2004-2013), indicates that out of total wells analyzed, around 39% of the wells are showing decline in ground water level in various parts of the Country. India receives an average rainfall of about 1170mm which corresponds to an annual precipitation of about 4000 BCM(Billion Cubic Metre) including snowfall. However, there is considerable variation in rainfall both temporally and spatially. Nearly 75% of this i.e., 3000 BCM occurs during the monsoon season confined to 3 to 4 month (June to September) in a year. After accounting for evaporation the average annual water availability in the Country has been assessed as 1869 BCM. It has been estimated that owing to topographic, hydrological and other constraints, the utilizable water is 1123 BCM which comprises of 690 BCM of surface water 433 BCM of replenishable ground water resources. As per latest assessment made by the CWC in 2010 the live storage capacity of completed projects is 253.388 BCM. As per assessment conducted by CPCB in 2015, the sewage generation capacity for Urban Population of India for the year is estimated to be 62,000 MLD approximately against sewage treatment capacity of 23,277 MLD with 816 STPs(Sewage Treatment Plants). The works under ‘National Ganga River Basin Authority’ (NGRBA) Programme include laying of sewerage system, sewage treatment plants, solid waste management, common effluent treatment plant for controlling industrial pollution, river front management, crematoria etc. Ministry of Water Resources, River Development and Ganga Rejuvenation is supplementing the efforts of the States for pollution abatement of river Yamuna, a tributary of River Ganga, by providing financial assistance to Haryana, Delhi and Uttar Pradesh in a phased manner since 1993 under the Yamuna Action Plan (YAP). Under YAP-I and YAP-II, an expenditure of Rs. 1514.70 crore has been incurred for creation of new sewage treatment capacity of 942.25 million litres per day (mld) in the States of Delhi, Haryana and Uttar Pradesh. In addition, a sum of Rs. 1656 crore has been approved for Delhi under YAP-III for rehabilitation and up gradation of existing Sewage Treatment Plants (STPs) (950 mld) and trunk sewers. This has been further supplemented by Jawaharlal Nehru National Urban Renewal Mission (JNNURM) for Rs. 1357 crore for an interceptor sewer project to intercept and treat untreated sewage flowing into river Yamuna from three major drains namely Najafgarh, Supplementary and Shahdara. Besides these, two projects have been sanctioned in Sonepat and Panipat towns at a cost of Rs. 217.87 crore for pollution abatement of river Yamuna. The main project components include construction of new STPs of 70 mld capacity and rehabilitation of existing STPs of 75 mld capacity. The works are being implemented by Public Health Engineering Department (PHED), Haryana. The Central Pollution Control Board (CPCB) has inventorized 764 Grossly polluting industries discharging 501 mld of trade effluent directly or indirectly into the drains reaching the river Ganga and its tributaries. The CPCB has also identified 144 drains along the main stem of river Ganga, discharging about 6614 mld of sewage/waste water. The CPCB has issued directions under section 5 of the Environment (Protection) Act, 1986 to 200 industries and under section 18 (1) (b) of Water (Prevention and Control of Pollution) Act, 1974 to 178 units. The Uttar Pradesh Pollution Control Board (UPPCB) has issued closure directions, to 98 tannery units. The CPCB has issued directions for the installation of real time monitoring by the units before June 30, 2015. The CPCB has also issued time bound directions for the implementation of Zero Liquid Discharge (ZLD) sector wise to prevent the discharge of effluent into the river Ganga.